The l-theanine in our formula requires slow fermentation to produce, and takes approximately 4 months to make one batch. It’s super-concentrated (more than 99 percent purity) and designed to open your natural “sleep gateway” to ensure you slip into a restful night. Nature’s Sleep Solution is also GMO-free, and every batch is tested to ensure it meets FDA gluten-free requirements. Now you can easily drift off to sleep with one convenient formula. Try Nature’s Sleep Solution for less than half the cost of a bottle of water a day. This natural formula can start working your very first night to settle you into sleep. Take this opportunity NOW to discover just how much better your sleep can be. Start giving your mind the help it needs to quiet and calm down, so your sleep gateway can open. Nature’s Sleep Solution comes with a full 60-day satisfaction guarantee. If you aren’t thrilled with your results, we’ll give you back every penny of the product price. Get Nature’s Sleep Solution™ Today! 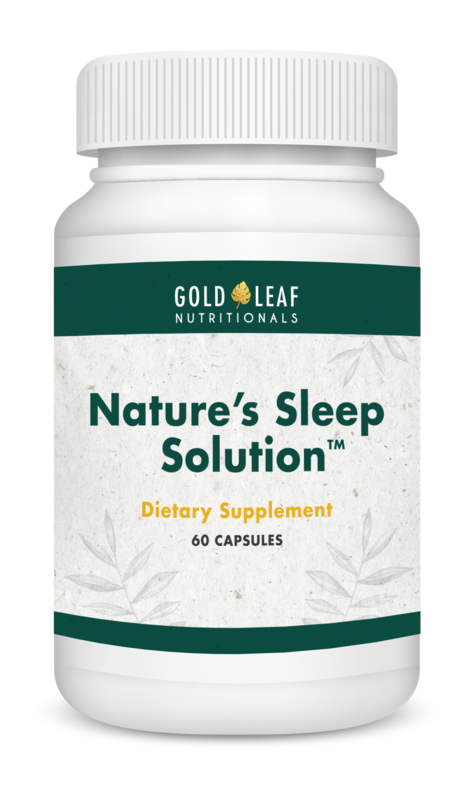 What are the quality standards Gold Leaf Nutritionals uses for their formulas, including Nature’s Sleep Solution? The facility we’ve partnered with has been inspected and registered as a GMP-compliant facility by NSF International, an industry organization that has even stricter standards than the FDA. It’s also NSF-certified. Batches are tested to ensure the proper amount of ingredients are contained within, and the final product meets all specifications for purity. Each time these tests are done, they are documented on a Certificate of Analysis which we review before allowing any product to be shipped to you. In her formal audit report, our Quality Assurance manager was impressed with our lab and concluded they took product safety very seriously. We regularly review our manufacturers on a yearly basis and ensure they stay in compliance with our quality standards. We also independently test our products to ensure the Certificates of Analysis we receive from our manufactures are accurate. Is there any soy or gluten in Nature’s Sleep Solution? Each batch of Nature’s Sleep Solution is tested to make sure it gluten-free according to FDA regulations. Nature’s Sleep Solution does not contain any soy ingredients, though it is processed in a facility that may process soy. Is Nature’s Sleep Solution GMO-free? Yes, Nature’s Sleep Solution is a non-GMO product. Do Nature’s Sleep Solution capsules have any kind of scent? Is Nature’s Sleep Solution made in the USA? Yes, Nature’s Sleep Solution is made in the USA. All you need to do is take 2 capsules 30 minutes before you want to fall asleep. Could you tell me more about how to get all three bonus reports? Certainly. If you choose a one-month supply of Nature’s Sleep Solution, you will also receive the bonus report Sneaky Caffeine Sources. If I have questions or am unsure about anything about Nature’s Sleep Solution, can I speak to someone on the phone? And just so you know, we don’t outsource our calls overseas. We want our members to experience the world-class service they deserve. If you have any questions about the ingredients, take a look at the product label here. If you still have questions, please contact your doctor. Our customer service is not able to provide specific advice on health. Yes, your supply of Nature’s Sleep Solution is 100% protected by our no questions asked anytime guarantee. You have an unlimited amount of time to try it out. If at any time you’re not thrilled with your results, we’ll refund you every penny of the product price. Nature’s Sleep Solution is better than other products I’ve tried. I fall asleep faster, and it just seems like I am more relaxed. I’m ordering more. I seem to sleep much sounder at night. When I have to get up to go to the restroom, I go right back to sleep. My sleep has improved greatly since I started taking Nature’s Sleep Solution. My husband loves it, too. I realized Nature’s Sleep Solution was working for me when I woke up the next morning after seven hours of solid sleep. Nature’s Sleep Solution helps me fall asleep after my cat wakes me up in the middle of the night wanting attention. Keep up the good work. I could tell Nature’s Sleep Solution was working for me the first night. It doesn’t give me a hangover, and my mood has improved from getting better sleep. Try Nature’s Sleep Solution Tonight! Try Nature’s Sleep Solution tonight for less than half the cost of a bottle of water a day. It contains l-theanine to open your sleep gateway, and six other ingredients to ensure you fall into a deep sleep and stay asleep the entire night. Take this opportunity NOW to discover just how powerful this natural formula is for helping your sleep. Start getting the refreshing sleep you deserve. And… if you aren’t thrilled with your results, we’ll give you back every penny of the product price.